Although HTC intentionally skipped launching any new smartphones in MWC 2014, they will be releasing the successor of HTC One on March 25th. There have been a number of leaks recently on the updated HTC One codenamed ‘M8’. 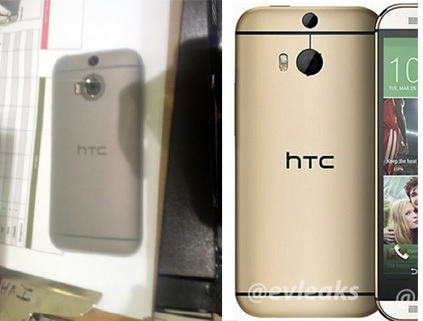 We posted a render of the upcoming HTC smartphone in gold which was leaked by @evleaks, the serial leaker. Wonder whyy the companies are going after the color gold! Even Samsung Galaxy S5 has one now. Another image has surfaced in Hardforums where the user who submitted it claimed that it was an evaluation model provided by HTC. The pictures show both rear and the front-face of the smartphone. Comparing the pictures with the leaked press render provided by @evleaks, it looks quite similar. Both of the pictures show the dual-camera sensors on the back and it has been rumored that the device will be more thinner and faster than the previous model. The HTC M8 aka ‘ All New One ‘ will most likely boast a 5-inch display sporting a resoltuion of 1920 x 1080 pixels, armed with Snapdragon 800 chipset, 3GB RAM, 16GB storage with microSD clot and will ship with Android 4.4 pre-installed. HTC has also posted a teaser video of their upcoming device which does confirm about its existence but nothing yet about the specs. Since this has been numbered as the first video, we can expect more videos in the coming days.